Ok.. Who makes it? I have thought about getting an ice cream machine but got to reading up on some recipes online and it "seems" to be more work than I expected. A lot of wait and rest time, etc. So.. Anyone make homemade ice cream? Pointers, tips, advice? Any recipes to share? I'm the same as you,BUT wife bought me the machine a year ago, I read the instructions.......it's still sitting in the garage. I get a ribbing about it every now n then. I should make the effort.?? Russ wrote: I'm the same as you,BUT wife bought me the machine a year ago, I read the instructions.......it's still sitting in the garage. I get a ribbing about it every now n then. I should make the effort.?? Txd we are picking fresh strawberries from our garden ATM. I've made strawberry jam, coulis but now you got me thinking strawberry ice cream. I'll let you know if I can find all my parts to the maker. Keep you informed. Home made ice cream, man that bring's back some memories. I sat on the ice cream maker many summer afternoon's while my dad turned the crank. yeah, what Willie said, I'm on my way out the door but when I get back I'll see iffin I can find my Mom's old recipe - - - I do know that it had Junket Mix in it and was the best I've ever had. We got the kids an ice cream "maker" for christmas. Makes a pint at a time, but it's not just a sit and spin. They have to be involved. Over all, takes about half an hour to forty-five minutes to make the pint. For the first trial run, we used a basic Ben and Jerry's Sweet cream recipe and added a tbs of vanilla extract. It turned out really well and the kids loved the family participation. OK, I had to make a phone call or two but ?I think? I have Mom's Ice Cream Mix Recipe. 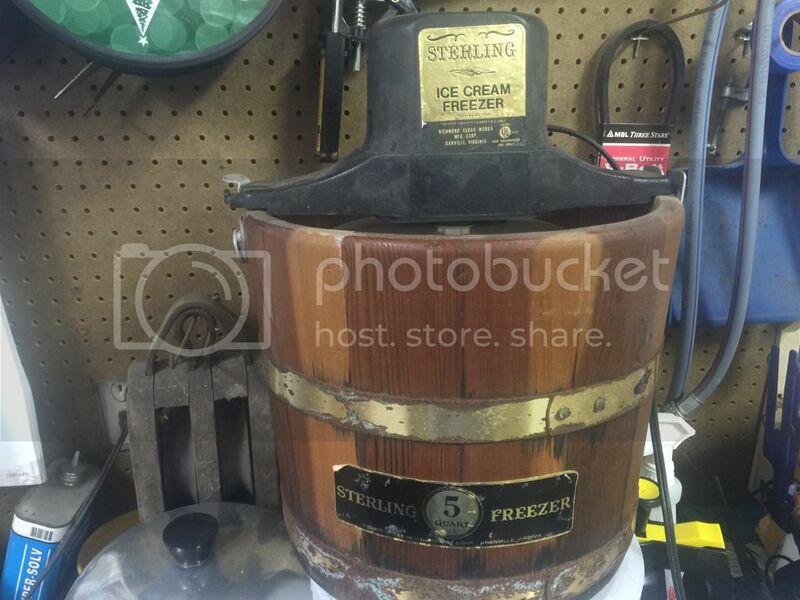 My pops loved making ice cream when us kids where growing up and yea OUP it was with a hand rank machine. For every birthday of us boys pops would get out the ice cream maker and mom would make a German Sweet Chocolate cake from scratch. Oh baby !!! My mom gave me dads machine when he passed away a few years back. When all us boys moved out of the house pops upgraded to a electric machine. It's pretty old but I'm going see if it will fire up. She still works and the instructions are still readable. Ta da!!! Found the base for the ice cream maker, wife thinks she knows where the motor stirrer thing is, report back when I have a go at ice cream.we are picking fresh strawberries so it might be that . Good stuff posted since I last checked up here! Bill: Happy to bring back some good memories! Let us know how the first batch comes out for ya. OUP, thanks for that recipe! I will give that a whirl when I get my IC maker Russ: I need to get with my aunt when it's strawberry season; she lives in the strawberry capital of Texas; Poteet. TX1911, That is a nifty little gadget. So you mix all the ingredients then play kickball?